Could a stock with a low P/E ratio and long-term contracts be a riskier investment than it appears? Image source: Diamond Resorts International. The timeshare business is arguably one of the most controversial in real estate today. It can bring huge profits to investors, but also comes with high-pressure sales tactics that can leave customers with expensive mortgages and fees that are hard to get out of. And that's been a major criticism of Diamond Resorts International (NYSE:DRII) in 2016, as highlighted by the New York Times earlier this year. With all of this in mind, is Diamond Resorts a safe stock or a risky one that's ready to implode? The answer is harder than you might think. If you look at Diamond Resorts' financial results, there's little for investors to complain about. Revenue has nearly doubled since the beginning of 2013 and net income is up sharply as well. DRII Revenue (TTM) data by YCharts. From a valuation perspective, there's not a lot to complain about, either. The stock trades at just 10.3 times trailing earnings and 8.0 times analysts' estimated forward earnings. What could look better? While the financial condition of the company looks great, it's hard to see how things could get much better. The economy is growing, unemployment is low, and interest rates can't be much lower. The impact is a booming real estate market today and strong sales of timeshares. From a macro perspective, it's easy to argue that operating conditions will only get worse from here. A recession could hurt the company, as it did during the last one, and even a small uptick in interest rates could dampen demand. It's this macro concern that probably has investors seeing less value than there appears to be in Diamond Resorts' shares. What's really hurt shares this year is fear that the Consumer Financial Protection Bureau will start regulating the timeshare industry's sales tactics. One of the ways companies like Diamond Resorts makes money is by pushing people to sign contracts quickly and by generating long-term revenue from management fees in resorts. But those contracts and fees can be complicated and difficult to get out of. And that's what's bringing regulatory fire. We don't know what might happen from a regulatory perspective, but the risk is almost purely to the downside. And that makes the value figures I pointed out above and the macro picture look a little less desirable. 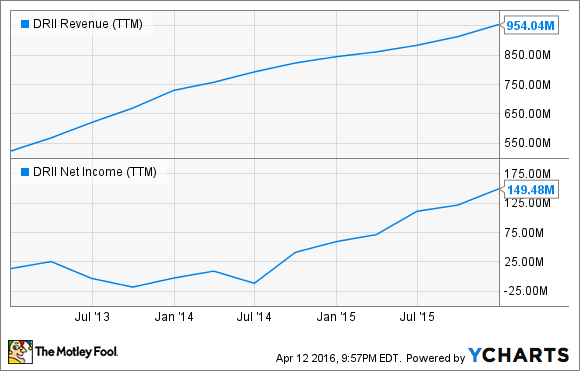 On the surface, Diamond Resorts looks like a value stock with ongoing revenue running resorts. What makes it a less safe stock is the regulatory risk associated with a federal agency looking over the industry. And it's that risk that makes me think Diamond Resorts may be hitting an operational peak and isn't the safe investment it may appear to be.